We won’t blame you if you spend your time drooling over the $2,000 drones and the incredible photos and videos they produce. The same goes for those superfast racing drones that pull off all kinds of stunts. At the same time, drones that match your mortgage payment aren’t just unrealistic, but they’re unnecessary when you’re just starting out. The last thing you need is to sink $500 or even $1,000 into a new toy only to break or lose it during one of your first outings. Shortly after drones increased in popularity, companies like the Sharper Image started working on scaling the technology back into its purest form. That’s what the Sharper Image DX series is all about: creating fun, scalable toys for both kids and kids-at-heart. The Sharper Image DX-2 drone isn’t designed to provide professional grade photos or do much at all. Instead, it focuses on fun. Designed to fly around your living room or backyard for five minutes of fun, the Sharper Image drones are a safe, simple toy that is fun for everyone. The DX-2 is the second of four drones in the series, and it’s distinctly different from both its predecessors and those that came after it. In our review, we cover what makes the Sharper Image DX-2 different from other drones in the series and compare it to other toy drones to help you see whether it's worth adding to your RC collection. Do They Require FAA Registration? The Sharper Image DX-2 drone is a lightweight stunt drone marketed as a starter choice for those who haven’t flown a drone before or are looking for an inexpensive stunt drone for practice. Best flown in a cavernous living room or a backyard, you’ll find the DX-2 has a small flight range and a short flight time but remains big on fun. Thinking about buying a Sharper Image drone? Here’s what you need to know about this drone model. The DX drone series features a progression of four stunt drone models targeted at hobbyists with a small budget. The first two models in the series stick solely to stunts, but later updates add cameras and other features better associated with drones. Each of these models sits below $100 but sit as a gateway to more advanced drones. If you’re going to learn how to fly a drone or you don’t have much use for drone photography, the DX series offers what you need without expensive additional features. The DX-2 measures 12.8” x 12.0” x 3.8” and hosts a six-axis gyro and 2.4 GHz transmitter. Flight time ranges from five to seven minutes depending on conditions like wind and the age of the battery. It also has a flight range of 150 feet. The body features four LED lights to improve visibility in the sky and for a more pleasing aesthetic appearance in-flight. These two features make a huge difference for new fliers because they add some automation that simplifies the flight. Autopilot and auto landing receive additional aid from the auto orientation feature that keeps the drone balanced. You no longer need to strike the perfect position in the air to fly. You receive some help comes straight from the aircraft. Overall, the DX-2 drone flies better than previous models, and it’s generally easy to operate. You’ll spend maybe fifteen minutes in the field practicing and seeing it plummet to the ground. However, a quick read of the guide and a few minutes of practice tend to sort out the limits. Soon enough, you’ll have enough control to push the drone’s boundaries. You might find that the controls are sensitive. Prepare for sensitivity before you fly, and you’ll stop the drone from running away on you immediately. Sharper Image’s DX-2 drone features a six-axis gyro. The drone’s six-axis gyroscope is one of its most essential features as a stunt drone. A gyroscope, or gyro, senses the drone’s angular velocity. A three-axis gyro includes three standard sensors for orientation that help your drone pitch, roll, and yaw across the three axes. A good stunt drone needs a six-axis gyro for better control. The six-axis gyro boasts the three orientation sensors in addition to three accelerometers. With the added sensors, your copter better understands its position and resists altitude displacement and prevents it from falling. Drones with a six-axis gyro also better detect falls and unusual altitude measurements. If your drone starts to fall or get away from you, the gyro helps it right itself and find a stable hover. Pilots find it easier to push the upper end of the drone’s height and distance limits with the gyro and prevent it from being damaged. The remote control requires six AA batteries not included in the box. No, the Sharper Image DX-2 is small enough to evade the need to register your drone with the FAA. However, be sure to keep it away from airports and airfields to avoid any trouble with the law. 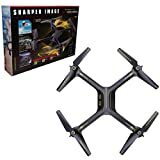 Buy the Sharper Image DX-2 drone for as little as $29.98 at Walmart or new from around $ and up on Amazon. 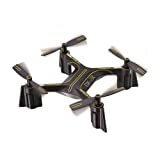 The price puts it significantly below typical stunt drones, and better reflects an RC toy price. Reviewers suggest the experience you get is reasonable for the price, but don’t expect it to hold up to many traumatic crashes. 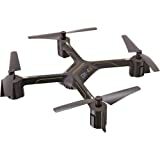 Other drones in the same category reach price points as high as $100 to $200, which makes the DX-2 drone inexpensive even within the budget category. Back in the day, toy drones were few and far between. Today, you have a considerable number of options, and if you weigh them carefully, you walk away with an excellent drone for a fantastic price. We compare the DX-2 with its other DX series companions as well as with competitors from different ranges to put the features in perspective. Reviews find that DX-2 offers a better flight experience compared to the earlier DX-1 version while the flight time doesn’t receive an extension, the range grows considerably. The DX-1 offered six to seven minutes of flight time, which compares to the DX-2. However, the flight range jumped from 100 feet to 150 feet between models. In addition to tacking 50 feet onto the control range, the DX-2 added the auto landing mode as well as the off-leashing feature to make the most of the extra 50 feet. The DX-3 offers the same features as the DX-2, but it adds both flight time and an extended flight range. Owners of the DX-3 enjoy 450 feet of freedom and up to 10 minutes of flight time per charge. Moreover, it’s also the first in the series to come with a one-megapixel camera and a four gigabyte MicroSD card for storing images. You can also connect it to wireless networks to transfer data or stream camera footage to another device. Sharper Image needed to increase the size of the drone to account for the camera. As a result, the DX-3 both heavier and taller than the DX-2 at 2.6 pounds and 0.9” x 14.4” x 3.6”. The Sharper Image DX-4 fits more into what most consumers associate with today’s drones. The latest model includes a more functional remote with multi-directional capabilities, joysticks, and a single button for completing stunts. It also added an auto take-off features to the auto-landing and off-leashing features found on earlier models. Sharper Image added an improved FPV HD camera. Supporting picture quality required more than an upgraded camera, so Sharper Image also installed an auto-hover feature for stability and enhancing video quality. Additionally, the same upgrades to the control range and flight time remained. The DX-4 includes a 450 range and flight time of 10 minutes compared to 150 feet and six to seven minutes offered by the DX-2. Let’s dive into our first product from outside the Sharper Image range: the Parrot Mambo FPV. Parrot drones are well known for being kid and wallet-friendly. Parrot’s Mambo FPV doesn’t disappoint in either respect. The quadcopter comes with both the aircraft and an attachable camera that’s well suited to beginners because of the added autopilot capabilities. Its simplicity is a key selling point, but that should also mean it’s not ideal for racers. Fortunately, that’s the not the case. Parrot added the Drift mode and Racing mode to address the issue. Turning on these modes disconnects the autopilot feature and creates an entirely manual drone. If you’re looking for a practice or beginner racing drone, try the Parrott Mambo FPV. Suit up with the GestureBotics glove controller to fully control your drone using hand commands, superhero style! 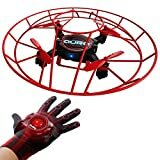 The Aura Drone with Glove Controller is ideal for any age level because it uses hand gestures rather than fine motor control to fly. Rather than using a console controller, you strap the device to the back of your hand and move it up, down, left, and right to maneuver it. If you want to do tricks, hold the button found underneath your them. In addition to being easy to fly, Aura also added protection for its propellers. One of the biggest grievances of the Sharper Image DX-2 is the flimsy props. The Aura Drone bounces off surfaces so it won’t break on its first couple of outings. The drone flies for around five minutes and features a removable battery. You’ll also get two additional sets of propellers in the box. Other drones take all day to charge and five minutes to deplete, and so does the Aura. However, the Aura offers the option of replacing the battery with a cheap spare, so you can keep the fun going. 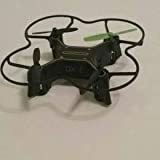 Overall, reviewers tend to stay away from the DX series because they function more as inexpensive toy drones and don’t even offer some of the most standard features found in other drones. When the DX series is the subject of a review, professionals tend not to put more stock in them than they deserve. They recognize them as budget or first aircraft for hobbyists or for those who are very new to drones. Some appreciate the DX-4 as having the potential to be a professional tool, but by the time you need something “professional,” it’s often time to grow your budget. Real customers veer between recognizing it as a suitable beginner drone for kids or adults and telling future customers to veer far away when possible. One theme that stood out continuously is the fly-away issue. Many hobbyists found that the both the DX-2 and its predecessor flew away and out of the control of the operator. They suggest that the 150-foot rating provided by Sharper Image is very much incorrect. Those who know what they’re getting for the price admit that it’s fun and flies well but only in the best conditions. They recommend avoiding flying the drone in any wind to make the most of its capabilities. Keep in mind that it features a built-in battery. If the battery fails, then the drone no longer operates. Although built-in lithium batteries are now standard across the industry, the quality of the battery plays a vital role in the success of the feature. Finally, several people reported that the blades fall apart in no time. It seems that Sharper Image acknowledges this because it includes replacement blades in the box. Overall, the Sharper Image DX-2 is a fun toy and a cheap practice tool, but its performance reflects its price. Too many customers report only using it once because it either broke or flew away after the first outing to recommend for us to recommend it as a birthday present. However, if you’re a regular flyer and want a basic toy to add to your collection, the DX-2 offers more properties than the DX-1 as well as fun for the right crowd.